The five co-authors of 365 Caregiving Tips: Hospitals, Care Facilities and Hospice, Practical Tips from Everyday Caregivers have one goal: help other caregivers by sharing practical caregiving tips. Pegi Foulkrod, Gincy Heins, Trish Hughes Kreis, Richard Kreis and Kathy Lowrey are caregivers themselves so have come by these tips through research, common sense and trial and error. They are driven to save the more than 40 million other caregivers the research time and the trial and error that comes along with caregiving. There are a variety of situations caregivers tackle and all five authors have dealt with their share. One of the reasons they became such close friends, even while scattered across the country, is because they helped one another through all kinds of caregiving situations. Some of the most important tips they shared with one another involved hospital stays, care facilities and hospice. Millions of caregivers face these same situations so it was an easy decision for them to focus their third book on practical tips to help caregivers during these difficult times. The authors understand caregivers have enough to do and are stressed out when their loved one is hospitalized, staying in a care facility or entering hospice. They are committed to helping others through these challenging times and are confident the practical, easy to read tips will help. As an added bonus, the beautiful cover art was created by Pegi Foulkrod who used art as an outlet to find peace while she cared for her husband. Caregivers find her art soothing and comforting during stressful times. 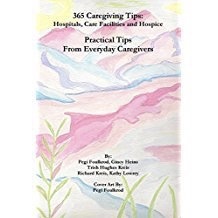 365 Caregiving Tips: Hospitals, Care Facilities and Hospice, Practical Tips from Everyday Caregivers can be found on Lulu.com or Amazon.com. The first two books from the authors, 365 Caregiving Tips: Practical Tips from Everyday Caregivers and 365 Caregiving Tips: Travel and Respite, Practical Tips from Everyday Caregivers have also been translated into Spanish.